Call me L.A. selfish, but I am greatly opposed to creating a “Best of L.A.” list, especially for our foods & restaurants. I cringe when local magazines print their “Best Of” issues, and here’s why. Growing up in L.A., I’ve accumulated over 40 years of my own best and worst food knowledge based on countless miles of adventure, explorations, accidental discoveries, bouts of food poisoning, word-of-mouth, patience, and just plain old trial and error.I measure those countless miles traveled as highly treasured experiences that have forged my strong bond with this city while nurturing many friendships and relationships with many good people who live and work here. I don’t mind giving an occasional tip to someone who seems like they’d really enjoy and appreciate a place as much as I have, But when I picture some trendy-trippers or jet-set hobos dropping in on my town with a sense of entitlement to instant gratification, skimming the city’s cream of the crop while posing like regulars without paying their dues, or when I read about new to L.A. transplants asking “Where do I find Boston Style This”,.. or “Chicago style that” it all makes me quite buggy. But that’s just my trip. Most “Best Of” lists include well known gastronomic treasures that have been discovered and rediscovered by new generations of fans, but in my humble opinion, cherry picking the town denies you the opportunity to actually LIVE it, and denies our town any chance of at least trying to form a sense of community. So, don’t look for any shortcuts from me, I will rarely reveal my favorite L.A. eats. I say, walk the streets, get out there on your own and find what makes you happy. Besides, most recommendations can be very over-rated. I am glad however, to provide my own little nostalgic list of “Long Gone” local favorite L.A. eateries that made my life a happy one throughout the years. These places have now faded away into the graveyard of L.A. memories, But if you happen to recognize any of these, hey- you’ve got (had) great taste! For some reason, most of my favorite joints were non-fancy dives, “Comida del Pueblo” as my Dad would say. 1. The Original Johnny’s Shrimp Boat– 2nd & Main St., Downtown L.A.
You’ve heard of the red carpet? This place had a “Wino Carpet”. You literally had to step over them to get into this tiny shed where a bunch of Asian guys furiously flung battered shrimp around clouds of grease. You’d order fried shrimp to go and the paper bags would be transparent by the time you got home. I remember eating my short ribs, gravy & rice with a slice of buttered bread sitting in the family car while watching the boxers across the street go upstairs to the Main Street Gym. The original owner’s kin opened another Johnny’s Shrimp Boat stand that still operates today. It’s OK, but not like the original. 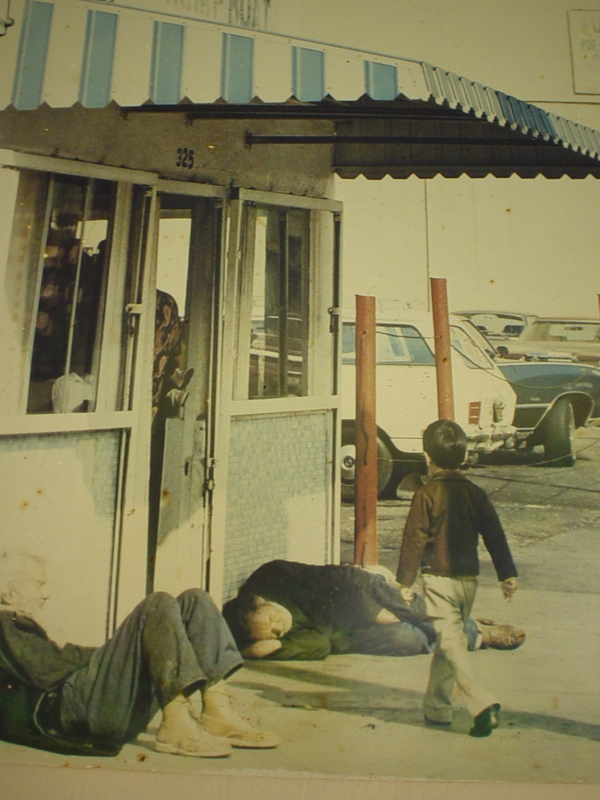 Photo Above is of the Original Johnny’s Shrimp Boat on Main St., Downtown, circa 1970’s. 2. Thrifty’s Coffee Shop– Whittier Blvd. & Ferris Ave., E.L.A. Good God. The Logjammer Breakfast. The Apple Cobbler with Vanilla Sauce, A La Mode. The Strawberry Shortcake with whipped cream, all indescribably delicious! When I’d finally get up from their food counter, I’d go into the store itself and whatever was left of my allowance I’d spend it on Comic Books and Hot Wheels®. 3. Chicken Boy– Broadway & 4th, Downtown L.A. When my parents would take me downtown, or “EL Centro” as everyone called it (funny- I remember downtown always being called “The Center”, so the Eastside really is…., sorry! I digress..) We would often eat at Chicken Boy’s. Huge pieces of hot, spicy, crunchy juicy fried chicken with a mound of tangy cole slaw and fluffy rolls with honey. Back in those days, everybody could just walk into the movie theaters on Broadway with outside food, so you’d be watching the movie with the whole place smelling of everybody’s Chicken Boy Fried Chicken dinners. Hot dogs made in heaven. A little 8 foot shack where these two crazy old white guys worked side by side plucking hot franks and buns straight from a steaming hot box, slathered hot chili, onions & mustard on, hand squeezed fresh orange juice or made you a chocolate egg cream, and handed it all to you in about a minute after you’d ordered, for about three bucks. 6. Kmart– Whittier Blvd. City of Commerce. I don’t know about other Kmarts, but ours had a Deli/Snack bar with the greatest giant Submarine Sandwiches as well as Jell-O, pudding cups, Slurpies and all sorts of neat crap. I’d often be shopping with my Mom when the voice on the P.A. would announce, “Attention Kmart shoppers, Come to the Flashing Blue Light at our Deli right now and get two delicious Submarine Sandwiches for $1.00!” We’d all make a bee-line! 7. Bill’s Paradise– Beverly Blvd. & Hendricks Ave., Montebello. Unbelievably good late night comfort food. Menu favorites were the “Four Finger Dog”, and the “Bill’s Special Burger”. The running gag was that the waitress was giving you “The Eye”. When actually, she really only had one eye. Not funny. Some people are going to hell for that. There’s a sort of new incarnation of it today in the original location, but again, not the same. 8. Yee Low Deli– Atlantic Square, Monterey Park. The best freaking deli style Chinese food I’ve ever had. I have drool dreams to this day of their Black Bean Chicken, Egg Rolls, big thick Chow-Fun Noodles and Chinese Chicken Salad. If I had a Time Machine, I’d use a trip just to visit this place again. 9. Cha Cha Cha Panaderia– Whittier Bl. near McBride Ave., E.L.A. Everyone has their favorite Pan Dulce joint, but this one was legendary in our neighborhood. Every one of their breads was a delicious, fluffy treat. For about $2.00 you’d carry home two big, hot steaming bags of finger lickin’ good sweet bread and bolillos along with a box of “La Abuelita” chocolate for Mom to make. And that night, we’d eat like Aztec Kings. 10. Sears Candy Counter– Olympic & Soto, Boyle Heights. Who could make up their minds while choosing from that sweet selection of candy deep within the bowels of the Sears Roebuck store. While my Mom was upstairs buying my clothes in the “Husky Boys” section, I’d be downstairs blowing my pinchi allowance on chocolate covered raisins, coconut bars, popcorn and video games. I ATE CHINESE FOOD AND GOT GAS! This entry was posted in Food, Pendejadas, Rant, Reviews by AlDesmadre. Bookmark the permalink. Just came across this post and it brings back lots of memories. My parents had a business where we had Limo’s and back in 1990 or so, we took the limo down to Johnny’s Shrimp Boat. It was a special day for me – either a birthday or a graduation or something – I can’t quite remember. We ate the shrimp standing next to the limo and people would walk by wondering who was inside. I loved watching them take the shrimp, batter it up, and drop it into the oil. Good memories. The candy store at the back entrance of the 1st street store! is this still a blog? it seems people don’t write anymore comments. Late to this post as well, but for what it’s worth…my grandpa ran Bill’s Paradise until the mid-90s. I used to run around the kitchen and the back spaces as a kid when I visited him during the summers, chipping away ice buildup from a machine in the back that was always breaking down for horchatas or Orange Julius and getting fat from the tacos and burgers. The women in that kitchen could COOK man, I tell you what. B bag was Great! Whittier Blvd just west of Garfield. My dad grew up in bell gardens and they used to eat there all the time. Used to have a jukebox outside in the early days. They opened in 1956 and the same lady owned it until late 90’s. Combo green burrito with shredded beef would blow your mind. We moved to AZ in 93 and we would still go back to b-bag every chance we could. Taquitos were good and special quesadilla with pastrami. 2ND best was Plaza Guadalajara in Downey. Since 1977′ i was introduced to what to this day’ people swear to keep coming back ‘ in Huntington park ‘ last taco shop’ but the original closed down 2 yrs ago’ was next to mariachi plaza and birria jalisco’ on 1st these were the best tacos al carbon’ and the caldo de res was their signature plate’ tacos El Apache’ to this day are the bomb. Huntington parks apaches is on gage ave and Stafford st across lupitas bakery.